Every driver in the system gets an account with the balance. You can put your drivers on a monthly, weekly, daily or per-order based subscription. All the subscriptions are constantly repeated until you subscribe driver for another plan. 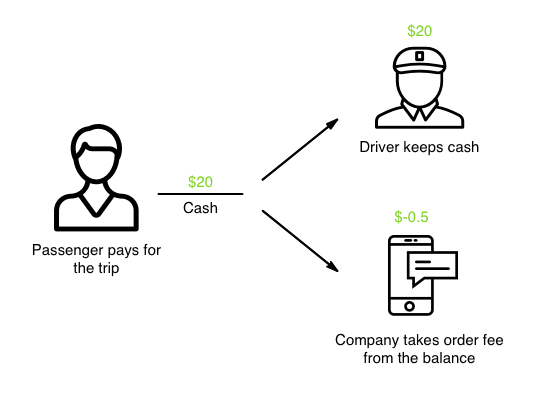 If a driver is set on per-order based subscription, his balance will be charged every time he takes a job. You can also combine per-period and per-order fees in one subscription. Please note: Once driver’s balance is negative, he will receive notification "You will not able to accept jobs since your credit is negative. Please add credit to continue work. You can contact the company administrator should you have any questions". If driver is online the very moment balance becomes negative driver goes offline automatically. Driver also receives email with notification on negative balance. When passenger pays your driver with cash, all the money goes to the driver’s pocket. That’s why billing system registers the payment but does not top up driver balance with the total received. It calculates order fee and charges it from the balance instead. So if your company receives cash/terminal payments only and drivers with negative balance are not allowed to work, advise your drivers to top up their balances before starting the shift. How does the credit card payments of the passenger flow? If a passenger pays for the trip with a credit/debit card, system registers the payment and fill driver’s balance with it. Then the system calculates order commission and charges it from the balance. While receiving credit cards payments, driver can use them to cover commission for cash/terminal jobs or fees per period. You can configure an automated driver payout and transfer earnings of the drivers to their bank accounts. So basically your driver always keeps cash and company gets commission through the balance. System makes all calculations and takes care that all commissions are charged in time.